SOLIDEAL Magnum widebase tyres benefit from advanced European technology to deliver exceptional performance under high load operations. 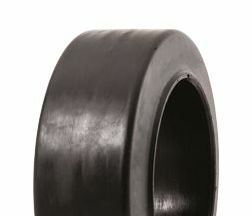 FIRM FITMENT BASE – provides a positive hold to the wheel to avoid slipping. PREMIUM TREAD COMPOUNDS – maximum life in service and mitigate head build up under high load applications. The new MAGNUM metric range covers size for various equipment such as forklifts, areobridges, ro-ro port terminals and dual wheel to single conversions.